In a world where nearly everyone has some sort of cybernetic implant, a virus like Halcyon is terrifying. More terrifying still, there’s been a recent spike in infections, and evidence points to the possibility of it spreading to the entire city and killing everyone at once, soon. The army and a company called Integrated Prosthetic Designs began a joint effort, dubbed Project Requiem, to create an antivirus capable of stopping Halcyon, but work on the project was halted when secrecy and contract disputes put politics above the welfare of the people. Now, it’s up to a ragtag group of grassroots activists to find the missing pieces of the puzzle and finish the work the army and IPD started before it’s too late; but politics are still in play, and neither the army nor IPD is making it easy for the group to do anything. 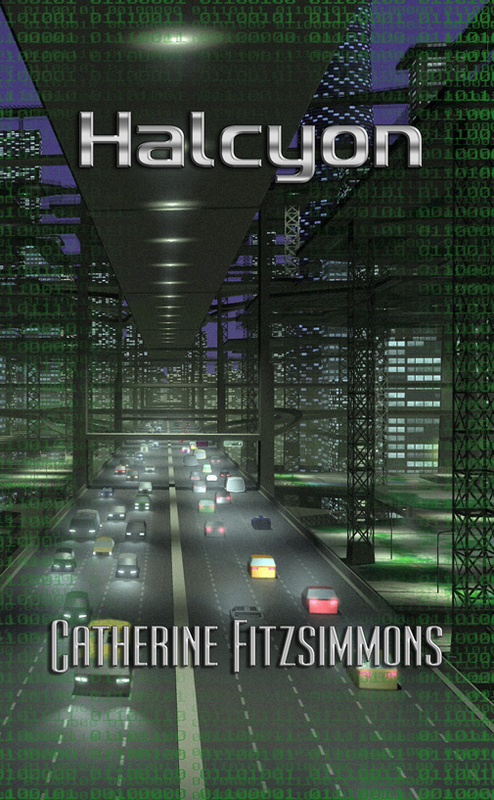 Halcyon is the second novel by author Catherine Fitzsimmons. The story starts off quickly and continues on at near breakneck pace with nonstop action throughout. The author’s writing is competent, but the text could benefit from a little spit-shine by a professional editor, fixing a few words here and there and trimming out some of the extraneous text that tends to lean towards redundancy on a number of occasions. Foreshadowing techniques could be more effectively used with a little more subtlety, rather than laying out blatant spoilers a full chapter ahead of time, but it still works without taking too much enjoyment away from the story. Characters tend to ‘yelp’ and ‘murmur’ more than they tend to say things outright, which can be a tad bothersome to some readers, but the story itself is a good read many will find highly entertaining, with a solid plot. Characters themselves could use a little more background and back-story to flesh them out a little more, but there is enough information there to keep them from feeling flat. Fitzsimmons is more than adept at getting more personal messages across through storytelling. Among them, corporate and political self-interest and basic human nature top the list. We humans do so love to create things we think we can control, but these things have a way of getting out. Sabotage, accidents, whatever… nothing is foolproof, nothing is 100% safe, no matter how much we want it to be. The author’s Smashwords bio says she has worked for “a number of evil empires,” and one can’t help but see that in Halcyon. Fitzsimmons is aware that corporations are in business to make money. That is their goal and what they care about. Big pharmaceutical companies don’t make drugs solely to help you feel better. They do it to help you out of your hard-earned cash. This is not to say no one in the company cares at all, but when faced with the choice between your health and their bottom line, they’ll choose their bottom line, every time. Such is the case in Halcyon. Less overtly, the underlying message is that it is often grassroots volunteer movements that do the most to care for humankind and move society forward. These movements are made up of people working from the heart, with a real passion for their work. Most of these people do not get paid for the time or energy they put into their work, and often they make huge personal sacrifices for the good of their cause. With so much meaning crammed into such an action-packed adventure, Halcyon is definitely worth the read. I would recommend it to adults and YA fans alike. Young fans of the cyberpunk genre are almost certain to love it.